In a heartfelt and brutally honest article, Jumping in the Deep End, written for the Sydney Morning Herald, Olympian Daniel Kowalski, recounts what his life was like as a closeted gay athlete and how he found his way to becoming a proud gay man. 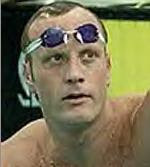 Daniel Kowalski won four Olympic gold medals in swimming for Australia. Currently, he works as an athletic career education adviser. I believe Daniel Kowalski can now add 'trailblazer' to his list of accolades as his coming out will inspire athletes, gay and non-gay alike, to embrace diversity in sports, and in life. IT IS hard to know where to start. Considering my sexuality and grappling with it has consumed my thoughts for so long, I figured it would be easy to put pen to paper and write about it, though as I have found out, it is not easy at all. Being a gay man with a foot half in and out of the closet is tough; the games it plays with your mind - and more importantly, your heart - are hard to put into words but I am going to try my best. I finally accepted my sexuality at the end of 2006 following a huge anxiety attack at work. After what were literally years of torment, denial and very, very dark times, I couldn't live a lie to myself any more. You often read that when people came out they had felt depressed or had suicidal tendencies. I, like them, experienced all of the extremes, but mostly it was the loneliness that was the hardest part of being gay - and still is. The number of times I have sat on the couch or lain in bed bawling my eyes out, scared and fearful of the future, are too many to mention. I know that people, regardless of their sexuality, experience this feeling, but stupidly in my mind I honestly felt that there was nowhere to go.